Self-reliant investors need reliable investment solutions to succeed in today's volatile market environment. And they want low-risk investment strategies to accomplish their long-term goals. Direct Investing gives you an innovative, focused approach to investing. It promotes a secure environment where you can invest according to specific recommendations and follow the fortunes of your portfolio choices. Whereas many financial publications bombard with confusing, short-term investment information, Direct Investing gives specific, reliable investment advice that has been proven to produce positive performance, even during bear markets! The performance of our recommended stocks* has been outstanding. 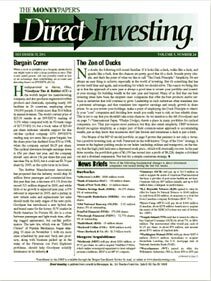 Companion to The Moneypaper publication, each issue of Direct Investing features one of six exclusive portfolios you can use as models for your investments, allowing you to spend less time on making your investment decisions and more on finding new opportunities for financial growth. With The Moneypaper Inc.'s Direct Investing, you are never alone in your investment decisions. Our newsletter is designed to give you specific, accurate, investment advice, ensuring your peace of mind while investing.